One of the big benefits claimed for no-dig growing is that the system reduces weed pressure as buried seeds aren’t brought to the surface by cultivation. There certainly is some truth in that but I don’t think it’s quite as effective as we’d wish. No-dig depends on the addition of compost to the beds each year – not a bad idea however you grow – but this year it backfired on me. I topped up some of my raised beds which are managed on a no-dig system, with a layer of compost prior to sowing a last crop of carrots. What I didn’t realise was the compost seems to have been full of chickweed seeds which promptly germinated and swamped the carrots. 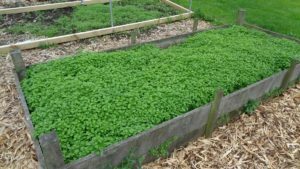 In hindsight – that lovely exact science – I could have easily sorted the problem if I’d known the compost was full of chickweed seed using the sacrificial bed method. It’s one of those old gardening methods known to the Victorians that has been rediscovered by market gardeners, the sacrificial bed. The idea is simple and effective. The bed is prepared as normal and then left for a week or two so that all those weed seeds germinate. The bed is then hoed off, which doesn’t take long as there are no crops to avoid. Then the bed is sowed with the crop which won’t have many weeds left to cope with. 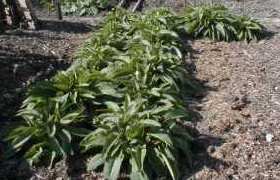 Some market gardeners in North America have taken this method even further and call it a stale bed. The bed is prepared as usual and then sown. 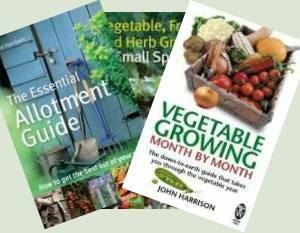 The crop I read about it being used for was carrots which the author knew would take six days to germinate. I think he used the same varieties year on year and the weather was the same each year in Canada to predict germination so accurately! The weeds, as they do, would germinate first so after 5 days he would flame weed the bed leaving it clean for the carrots to follow. Incidentally, flame weeding is very effective on seedlings. The idea is not to burn them off and scorch the ground, just pass the flame over them for a second so the leaves shrivel. The tender seedlings will die off but the soil below is just warmed slightly. I’ve still some of that chickweed filled compost to use, but when I do use it again I’ll use this method to clean the bed prior to sowing. Since even the action of hoeing disturbs the top soil and can cause a second germination flush of weeds, I’ll flame weed. 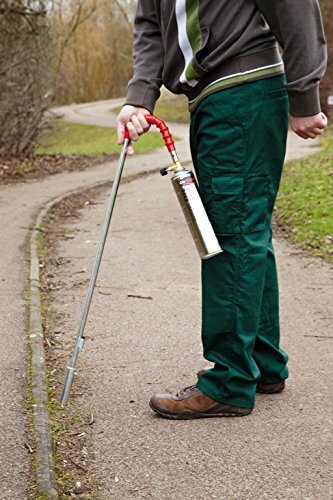 Flame weeders are pretty cheap to buy and they don’t use much gas. They’re a tool that’s been around for many years although years back they were paraffin powered rather than gas. The paraffin weeders were somewhat tricky to get and keep going though, a bit like primus stoves if anybody remembers them. Very interesting, I am going to use the sacrificial system in the future. Thank you. I tried a flame gun many years ago but noticed that there were lots of beneficial insects being destroy ie lots of spiders etc. (ihave also noticed this year (2018) that there were a lot of cabbage white butterflies but I have not seen one caterpillar not even an egg and my garden is largely organic??? Very interesting article and a simple method seems best! 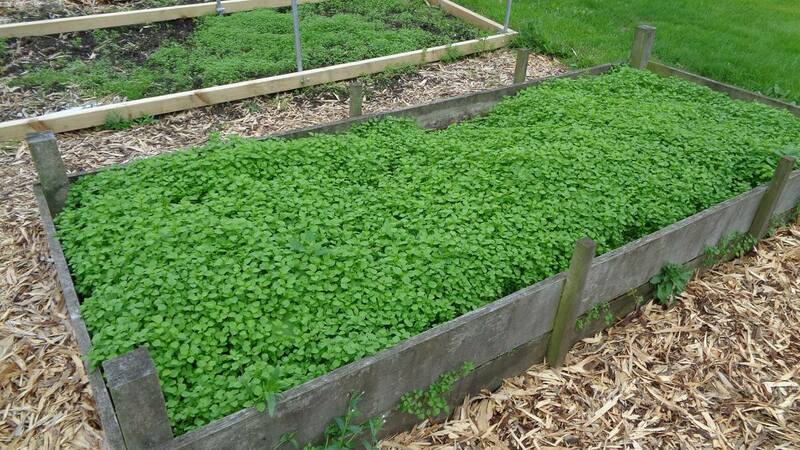 Never thought of tackling this problem with chickweed easily like this. I do have one of those big paraffin weed burners and yes an absolute swine to get going and keep regulated.However they are very good on larger weeds and especially good on the allotment.Another bonus is less chemical usage as the heat of the flame ruptures the weed cells and they die of naturally. Has anyone ever tried this method when growing parsnips from seed? Bearing in mind parsnips tend to be slow to germinate and hence weeds can get reasonable growth until the parsnips appear. My dad prides himself on his parsnips. He germinates them on kitchen roll and then sows them. He says it is foolproof. Maybe a good idea to go ahead and prep the Sacrificial Seed Bed and germination of seedlings same day. As you know, parsnips take their own good time to germinate. Hope this helps. Oooh. That’s interesting Polly. I’ll give it a go. Thank you! Interesting Polly, what does he do with them once they’ve germinated? Once they’ve germinated on the kitchen roll he sows them. I once heard that chickweed was brought over by the Romans as a salad vegetable, perhaps you could have eaten it and got 2 crops from the bed? I continue to learn new ideas, and the sacrificial bed is the newest idea that I will be incorporating into my gardening cycles. As I have finally figured out how to grow vegetables year round here in the southern part of the Piedmont of North Carolina, this idea of a sacrificial bed fits in perfectly. Raising all the beds is an ongoing project too and this added idea fits in with the cycle these go through too. Not so sure about the flame method for me though. Very interesting. I will give this a go next spring. I have been living in Corfu Greece for the last 4 years and have learnt a lot, regarding sowing times (up to 2 months earlier than UK) soil conditions, mainly clay that goes rock hard in the summer and I could make crockery out of it in the winter!I learnt about 20 years ago to do as a lot of Greeks do, that is plant in trenches, that way you don’t waste water and watering has to be done twice a day when temperatures are 36 Celsius and over, also to water the ground and not the plants to avoid evaporation. So I will adapt this method to my beds and hopefully it will work. Hi Mel – you lucky people, living in such a wonderful place. You might find some of Geoff Lawton’s stuff on permaculture in hot climates have helpful tips. Totally like the idea of the flame weeder. Was only looking at one last week. Never seen one before. Gardening in Oz is very different to the UK but I get many ideas from this site, I just need to adjust seasons to use them. 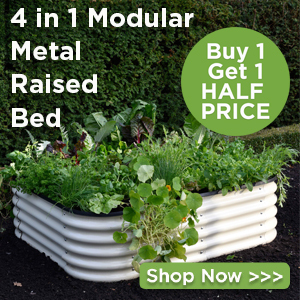 Having read about the sacrificial beds, that’s something I think I’ll have a go at. The majority of ppl in Oz & NZ believe POMS are THE best gardeners in the world, so that’s why we follow sites like this. Being born in the UK (came out as a kid on the 10 pound scheme), I’ve witnessed beautiful vegie gardens growing that we can only dream of. That’s not to say we can’t have them. We just have to do more work to achieve the same results. We’re currently building shade areas to grow our vegies in. Much more successful that the full sun it says on the seed packets etc. Another reason we seed save is that the seeds become used to our conditions eventually & we have better harvests then. But it’s all fun and I love learning more ideas each year to try out. We have used chippings around our fruit bushes – red & blackcurrant, & apples,pears, plum for several years with topups. fruits seem to like, this year bumper crops. underlying is a solid river clay, so only brassicas grow. We made a hugelbed with pallets, but the topping up with compost takes more than we produce. No dig has many advantages with arthritis. I haven’t used the no-dig method but being mostly skint, I used the local green recycling place to get cheap compost. Had the same problem as you with weeds. So it’s nice to know there is an answer to the problem. Thank you everyone for your tips on how to cure the weed problem. I have taken a lot of care with the soil on my allotment here in Coin Varin , St Peter,s Jersey C.I. but to no avail ? This Year I grew fantastic Toms, Spuds, and Beans, but the Weeds, ! terible, good job I have a guy with Chickens next to my Plot to eat them after I have dug them up ! Happy Gardening to one and all. P.S. my first Year with a ‘ Poly Tunnel ‘ simply Great, more food that I and my friends can eat . You have to ‘dig up the weeds’! So they must be big, catch them young, catch them often and giving them to chickens is wasting good compost material. I would argue that giving, at least some, of the young weeds to chickens is not a waste of good compost material, but is rather just altering the material and gaining an additional element of addition to the compost pile – chicken manure. Where I live my chickens are no longer allowed to free range (I have been swallowed up into the town limits and fall under their rules now). Since they are cooped now I need to grow greens for them, but have the benefit of now being able to collect and use their manure, a manure richer in nutrients than cow manure. How long do you leave your chicken poo to rot down before you use it. We also have hens and have been bagging it for use. Many thanks for your wisdom. Polly, I really couldn’t give you an exact time. I compost in three bins. The new stuff goes into the first bin and is turned and ‘watered’ regularly till it is full and then is turned into the second bin where it is turned and watered regularly until the first bin is filled again. The second bin is emptied to a third and final bin for turning until it has to be emptied to make room for the next round from the second bin, which has to be moved to make room for the stuff from the full first bin. The length of time varies according to how fast I can collect stuff for the first bin. I am guessing it is on average six to eight months from the start of bin number one to when bin three has to be emptied for the process to keep going.